Cambodia: Koh Rong High-Point Ropepark - See you on the trees! 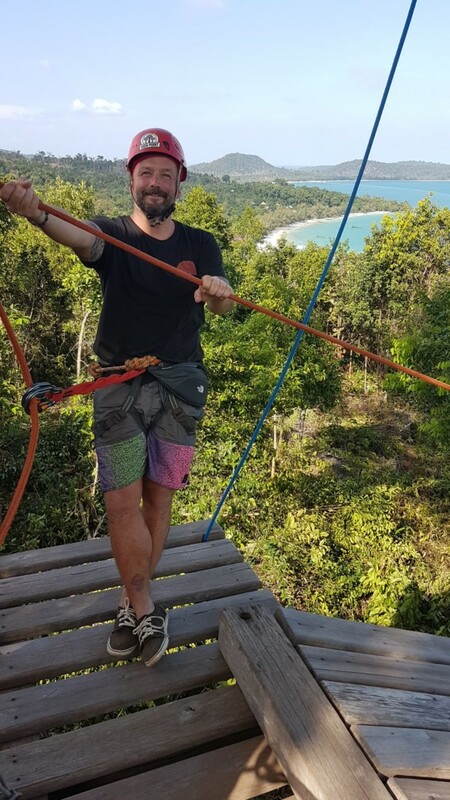 Home » Asien » Kambodscha » Cambodia: Koh Rong High-Point Ropepark – See you on the trees! Cambodia: Koh Rong High-Point Ropepark – See you on the trees! On our trip to Koh Rong we did -for sure- the zipline at Koh Rong High-Point Ropepark. We read already some facts and also some other guys we met gave us some advise to do. So…why not! We absolutly had a blast. We really had a lot of fun and it is definitely worth the money. Our guide was so cool and we chilled on “island-rooftop” with a breathtaking view (see pictures below), listening some music and had a nice smalltalk. Also we loved that the the park is absolutly in harmony with the nature! Why have we built High Point on Koh Rong? Because it’s Koh Rong, and when you see this Island you will understand, especially when you see it from the High Point Adventure park trees. The Island is nearly 70 sq. kilometers in size, that’s almost the size of Hong Kong! However, unlike the great H.K, Koh Rong has no skyscrapers, no cars, no concrete streets, it’s just beach, and jungle, lots and lots of jungle. In fact almost all 70 sq kilometers of this incredible island is covered in jungle, or damp rain forest. There are 28 beaches on the island almost all of them snow white sands and one that is close to 7 kilometers long with just a tiny few huts along it and a beautiful small local village at one end. A must see when you come to the island. There is one village of the few fishing communities on the island that has become quite popular with travelers and tourists over the last few years, sitting on a beach just under 900 meters long a small group of travelers and locals have set up some guest houses, bars, beach hut bungalows, restaurants, and even a dive center, allowing more people to enjoy what this beautiful Island has to offer but without taking away any of its charm. 3 to 4 boats make 4 to 5 round trips from the island to the main land each day. The journey is around 28 kilometers long so can take around 2.5 hours on the slow boats or as little as 40 minutes on the speed boats . Then in March 2014 in the tallest trees of Koh Rong Island, we opened up Cambodia’s first world class rope course park, High Point. When building the park 21 trees were carefully selected, then 25 platforms were built on those trees at heights ranging from four to twenty five meters!! Then the platform were connected, a web of ladders and cables making a route over 400 meters long without one foot ever touching the floor. Passing all twenty stages of the course for the first time takes on average just over an hour. The later attempts tend to get quicker and quicker, (how fast do you think you could complete the course??). There are various stages to the course, suspension bridges, walking wires, self-moving devices such as the ropewalker or flying surf, and of course we have zip lines. For getting though the course no preliminary preparation is required other than listening to the safety brief, any person can overcome all obstacles. Age and weight are also not an issue, if you are fit enough to walk to the office, you can fit in the safety harness and can attach a safety line at the average persons shoulder height, then we will get you through the course. Visit High Point — this remarkable and safe adventure, will allow you to let out your inner monkey and swing from the trees as our long distant relatives did and our more recent cute monkey cousin still do. You will experience the best views of this entire island and be among some of the most beautiful nature and wild life Koh Rong has to offer. It is a day you will not soon forget.